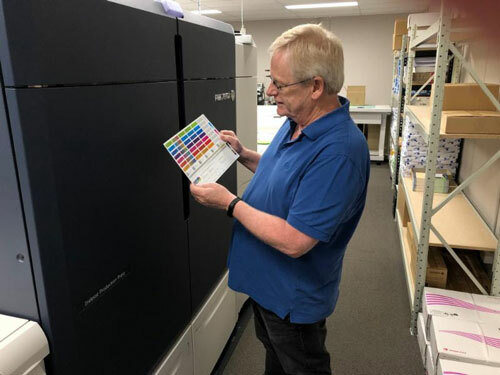 West Chester, Ohio, USA; January 2019—Intertype, a premier printer in Australia, recently installed a Fuji Xerox Iridesse press and became the first printer worldwide to utilize the Color-Logic process on this press. Discussing the installation, Color-Logic Director of Sales and Marketing Mark Geeves said: "Color-Logic is fast becoming the preferred process of Iridesse press users around the world. Intertype previously used Color-Logic on a Fuji Xerox Color 1000i press, so the transition to their new Fuji Xerox Iridesse was effortless. The company finds many customers for their metallic print offerings." Ian Bosler, Intertype CEO, commenting on his use of the Color-Logic process, said: "Australian customers are beginning to measure advertising effectiveness by tracking the return on investment of their marketing campaigns. They particularly like the metallic special effects we are able to produce using the Color-Logic process. Our use of Color-Logic has yielded many new projects from existing clients and has garnered us many new clients as well. Intertype, founded in 2004, provides a unique approach to the business of printing. The result has been an unbroken record of organic growth every year since inception and an enviable client base from all corners of Australia, along with a growing band of international clients. For more information, log on to www.intertype.com.au.